… and all through my house; lots of Christmas presents not finished, just ask this little mouse!!! Just wanted to pop by and wish all my friends and visitors a Merry Christmas and a safe, healthy & Happy New Year. Thanks for all the support you have given me over the last 12 months. I hope those of you who are busy stitching presents (like me) take time to enjoy the company of friends & family that this time of year brings and still manage to get those presents ready in time. I look forward to catching up with you after Christmas and to share some of my Christmas gifts both made & received. I also hope to do some stitching of my own over the break. Take care and may all your Christmas wishes come true. Well the busy time of year is now upon us and has kept me from blogging for a while. All the end of year concerts and break-ups etc take away from my sewing time. I’m currently working on some secret squirrel business for Creating Country Threads magazine for an issue next year so when it gets closer to finishing I just may give you a little sneak peek. My daughter has been busy stitching a present for her teacher and below is a picture of the finished product. It is a journal and I’m sure he will like it. I helped making the cover but she did all the stitching by herself. Thanks to Natalie Bird for her design from her little book All Creatures Great & Small. Natalie has a new Christmas Book out now – very cute. Visit Natalie’s blog to have a look. 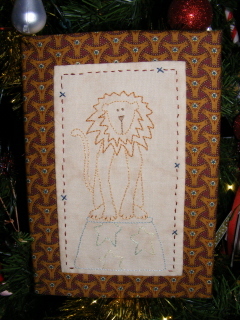 Have lots of Christmas stitching still to do, so will be back when I can.